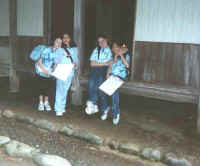 We went to Minka-en to study about what are the traditional houses and what the people who lived there were like. We were assigned to look at house number seven, the Emukai House, and it is a Buddhist chapel. It was built in the late 17th century and the early 18th century. They made the house by wood. 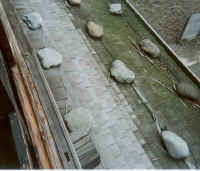 The roof was a sharply inclined roof so all the snow would slide down off the roof easily. It was like a stable in there and had lots of tools. 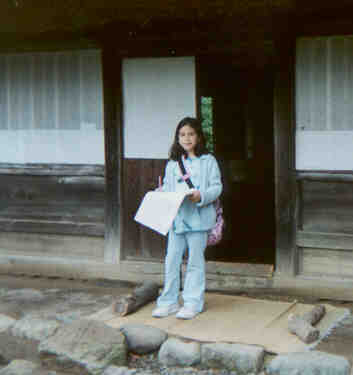 The people who lived here were the Buddhist priests, a samurai named Heike, and refugees. There was a kaibaire and it is for picking up the dead leaves that fell from the trees and put them in the kaibaire. It helps the people clean up outside, and also making it into a fertilizer for the crops. There was a pot to make mochi, and you have to pound the rice with a mallet. Justine and Melissa in front of their house. Our house was house number seven. It's name was Epukai. I was quite surprised when I first saw it because it looked like a stable! It was surrounded by a fence that was very hard to see since a bush had grown on it, as it was made of bamboo. Epukai was a Buddhist chapel, where samurai and priests lived, of course there was only 1 room for worshiping. The roof was made of straw and looked like a modern day roof with windows and everything. I think it was made of straw because it snowed a lot there. The bottom looked like a stable. It probably looked like a stable because there was a storage room and a stable inside. So that is what I found out and it was interesting too. 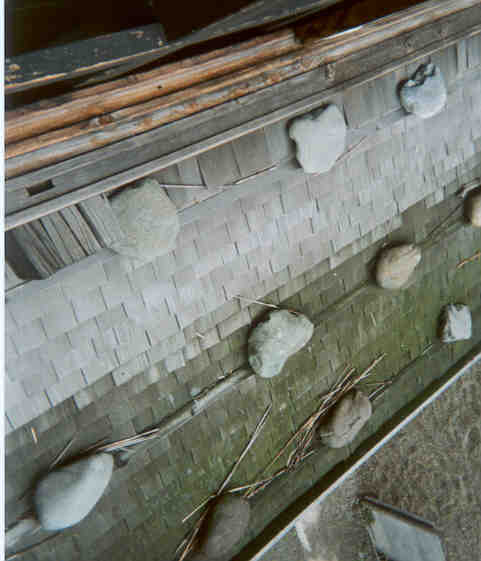 The stones holding down the shingles on the roof. The Emuka house’s sharply inclined wooden roof topped a frame made out of two sides of wood that was filled in with material of all kinds woven together. Which made sense as the house was filled with looms that wove the cloth of the Buddhist priests who lived inside. The cloth was made thickly as the weather was cold most of the time by the poor people who sought shelter in the monastery supported by the samurai, Lord Keikei. Without this place, many would suffer as they traveled the Tokaido Road.